Using the engagement ring that once belonged to his mother, Prince William proposed to his longtime love, Kate Middleton, last month during a trip to Kenya. There is no official date for the wedding as of yet, but it will most likely be next spring or summer. While some people may think it’s a bad idea for Prince William to use his mother’s engagement ring given how her fairy tale ended, but I think it’s sweet. And clearly meaningful to Prince William, and that’s what really matters. Prince William, 28, confirmed the news during a press call in London Tuesday. 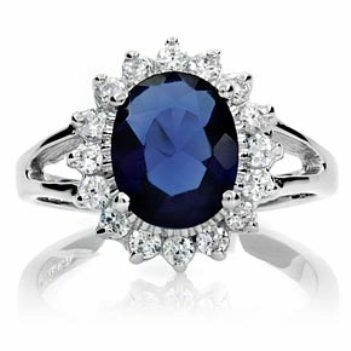 The ring is an oval blue 18-carat sapphire surrounded by 14 smaller white diamonds. Side Note: Kate, who is also 28-years-old, will now be referred to as Catherine. I can appreciate the sentiment of Prince William’s use of his mother’s engagement ring. Might seem a little cheesy to some, but I think his intent behind it is quite thoughtful and genuine. No doubt Princess Diana loved Prince Charles. It seems, however, Charles was in love or loving someone else. I don’t know the back story about Charles’ giving that particular ring to Diana upon their engagement. Was it to win her over? Prince William gave it to Cate because he loves her and loves his mother. I feel the marriage of Prince William and Cate will be a good one. Not without its challenges, but they will survive without need of a divorce.